Yesterday we were caught off guard, Squeaks was under the weather and we have lots of half finished craft things... but Squeaks got to do what ever she was up to... and that involved making sure Father Christmas is left something to eat when he stops by this evening. 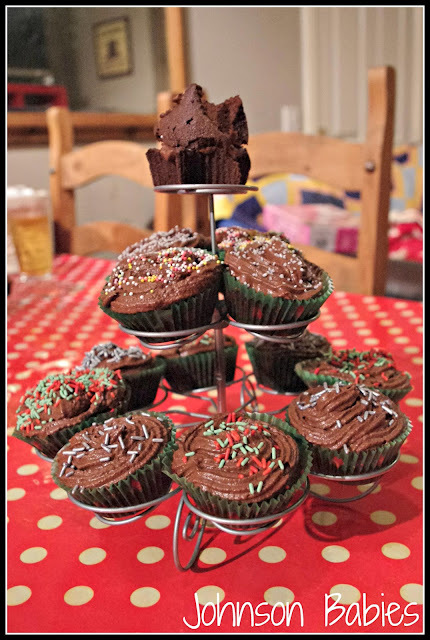 As I grow more confident in my cake making abilities I thought I'd stretch myself- to chocolate cupcakes! We used our usual basis for sponge: weighing the eggs (3), and equal amounts of butter and caster sugar. Usually we'd use an equal amount of self raising flour, but for chocolate cake we used 3/4 flour to a quarter of cocoa powder. And yes, someone got to lick the spoons! I have now learned that I only need 1/2 fill the cases to get a good sized cupcake. I once again tried my silicone star cases- I have yet to perfect these. After baking in the over for 20mins at 170 degrees celsius ( we always do the knife test by putting a knife in the middle and the knife comes out clean). We left the cakes to cool whilst we made some chocolate icing. We mixed the icing sugar, cocoa powder and butter together until it formed a butter icing. We melted the chocolate and then added, alternating between the milk and the chocolate, until everything was combined. We probably should have mixed for a bit longer after this as the frosting does become lighter and fluffier the longer it's mixed. I had an impatient patient who was ruling the roost! Then, the fun began! We piped the frosting on to the cakes and added 'decorations' to the cakes. This is by and far Squeaks' favourite part of the whole process- especially as she tips the whole container of sprinkles on to the cake. 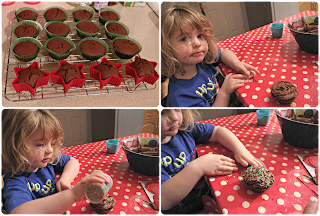 I did attempt to make 'fairy cakes' with the stars.. a work in progress! 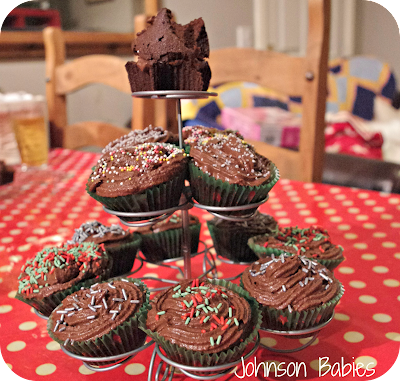 And amazingly, no-one has been allowed to test the cakes, not even Squeaks. She knows there are enough to go around, and is adamant that these are Christmas Eve cakes, and we must keep some back for Father Christmas visiting!